Characteristics of trees used in homeopathy, with keywords and themes, sorted by botanical family. 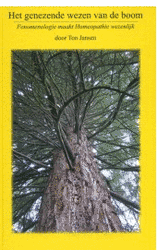 The book describes 41 tree families, different from the plant families. First the biological characteristics of a tree family are given, followed by its homeopathic theme. Trees within a family are separately described. Trees are often overlooked in healing human beings; their action covers a wide-range of pathologies and their healing power is great. Ton Jansen has formulated family themes drawing from his professional experience as a grower, love and knowledge of plants, phenomenological research and homeopathic knowledge. The descriptions are compact, making it easy to quickly select a remedy. The risk of a compact description is that it can be incomplete. However, references can be found in the extensive descriptions of plant remedies in the Materia Medica. There is a Dutch book version: Het genezende wezen van de boom, but there is no English book version available.